Dr. Andrew Siegel is a practicing physician and surgeon who is passionate about educating people regarding the importance of a healthy lifestyle and the role that diet plays in preventing disease. In his book, Promiscuous Eating, he aims to help you to understand your own eating behavior so that you can change it for the better. Siegal says that the key to long-term weight loss is creating a harmonious relationship with food. This book provides strategies to recognize and repair unhealthy eating habits so you can eliminate excess weight for good. Siegal defines promiscuous eating as “the wanton, reckless, unselective, casual, and indiscriminate consumption of foods without regard to the potential consequences of this “indiscretion”. It can be identified by an unhealthy relationship with food and a lack of commitment to eating healthy foods in appropriate quantities. Promiscuous eaters knowingly make food choices that are potentially dangerous to health and eat for reasons other than satisfying true hunger and nourishing the body. This way of eating is characterized by the sensation of physical bloating or feelings of guilt and regret following the episode of overeating. The foundation of Siegal’s approach involves the strategy of mindful eating where you learn to increase the awareness of your relationship with food regarding choices and the manner in which you are consuming food. He explains why we overeat and highlights specific foods that we should be wary of due to their negative effects on health. Additionally he outlines practical strategies and solutions to help you to manage your eating problems and achieve your weight loss goals. He explains that the ultimate goal of this program is for you to define and integrate your own mindful philosophy towards eating so that you will naturally gravitate towards healthy dietary choices. Vegetables, fruit, whole grains, pasta, lean meat, lean turkey, wild salmon, mackeral, sardines, low fat dairy products, peas, soybeans, lentils, avocado, nuts, olive oil, microwave popcorn, coffee. Promiscuous Eating does not include a meal plan. Exercise is recommended because it improves strength and fitness and makes us feel energized. Daily physical activities such as walking, housework and gardening are a good way to keep active. Additionally a regular exercise regimen appears to reduce the likelihood of emotional eating. Promiscuous Eating retails at $14.95. Click here to purchase this book in eBook format for a discounted rate. Helps dieters understand the reasons why they overeat. Promotes an increase in the awareness of food choices and eating behavior. Discourages the consumption of processed foods. 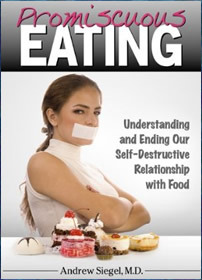 Addresses emotional eating and its role in weight loss. Includes personal stories of other dieters that the reader may relate to. Encourages a lifestyle approach to weight loss. Does not provide adequate information on what to eat and how to create healthy meals. A meal plan is not included. Weight loss results may be very slow with this approach. Does not apply to dieters who are not emotional eaters. Promiscuous eating is a guide to help you understand the reasons why you might be overeating unhealthy foods so that you can increase your eating awareness and make healthier choices. It includes a variety of practical strategies that can assist you to create positive changes in your relationship with food so that you can achieve your health and weight loss goals.